Companies can skip the middle step of asking a client to log onto a website or social media platform to get information. Print products offer a direct line from the business to the consumer. Clients can fold up printed hand outs, easily transport them from place to place, reference them at their discretion and pass on the good word. Here are some printed products that get a business's message out there. Some of the most effective marketing strategies avoid a hard sell, especially to younger generations, reported ABC News. This means that inconspicuously promoting an organization could produce more positive results than directly trying to push it. The consumer may feel bombarded with information and sense that a company is only trying to sell them a product. They might look elsewhere because they want more than just a product, they want an education on it. In some cases, it's better to let them feel like they're ultimately in control of making the decisions rather than pushing them into them. 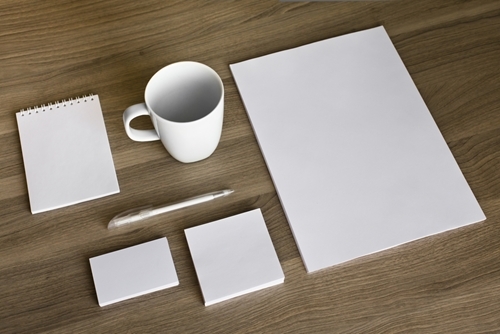 Images and phrases can be added to a notepad so that the company's brand is constantly being noticed by a client. Journalists, marketers and public relations professionals all jot down notes on notepads. These groups are great to garner the attention of because they are enablers of public promotion. Getting noticed by the right people can be a domino effect – word that a product or company does good work can spread and lead to more business. Giving people paper that they can write on enables them to work for an institution's marketing campaign. They can hand off notes with the company brand and information on them. Just because catalogs and notepads are effective strategies to muster up some more business doesn't mean that executives should neglect the importance of face-to-face interaction. Print products should be leveraged for those times that a business leader interacts with a consumer or colleague. They go hand-in-hand. Brochures are an effective way for a company to communicate what they do and how they do it. Specialty brochures may be printed up for an event or seasonal promotion or they can be printed with general information and used for months at a time. To create an effective brochure, business leaders should be cognizant of a company's brand when putting it together. Furthermore, they should construct the brochure in a way that it stands out and is representative of the company. Business cards have transformed from a way to give a client the company's basic information to a way to boost its brand, according to Entrepreneur. This change is due to the platforms like LinkedIn and the Internet. People can very well Google around and look up what products and companies are available for what they need. The business card can now be used as a mechanic for a company to distinguish itself from competitors, stated the source. In the way that brochures require attention to detail, executives should be strategic when creating business cards. The target audience and brand consistency should be taken into account prior to going to print, suggested Entrepreneur. Once those concerns are squared away, the company can go to print and let the consumer do the work.